I recently read about 2 artists who create installations in abandoned buildings and activate the space with art and narratives. Nothing new about that but for some reason they inspired me to think about creating a narrative about the cross, or a story, or series of poems or chants, or both! One of the composers I often listen to when I paint is Arvo Part, an Estonian who creates sacred music that is utterly original and haunting. I think about including audio in my work as well. 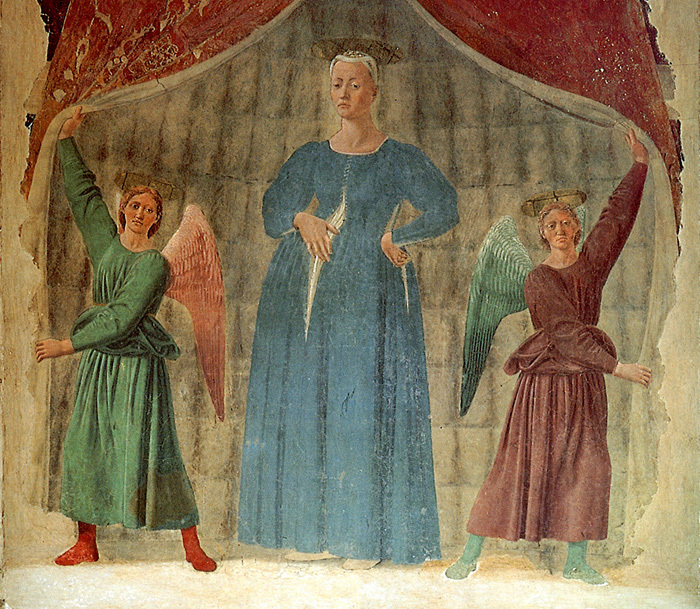 And then, while researching Philip Guston, I again read about his love for the work of Piero Della Francesca. For me, there’s hardly a more glorious painting than Della Francesca’s Madonna del Parto, but Guston had other favorites, including Piero’s Legends of the True Cross (!!). In a church in Arezzo, Italy he painted a fresco cycle narrating the miraculous stories of the True Cross, the cross on which Christ was crucified. Here is a cycle of stories about one of the most famous crosses and even more inspiration to follow through on this idea of creating a narrative. This entry was posted in LUCAD and tagged cross, madonna, madonna del parto, Pireo Della Francesca, true cross by vspain. Bookmark the permalink.